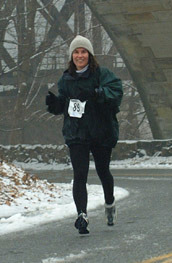 The hilly ten mile course for Wilmington, Delaware's Icicle Run is challenging enough in nice weather. But adding ice, slush and a cold rain can make it hazardous and miserable! Marathon Man (later known as Tuckin) was joined by several members of the Pike Creek Valley Running Club for the January 18th event. Thanks to Don Ropp for braving the nasty weather to photograph us at two different points along the way. The conditions slowed everyone. My time was 2 minutes slower than the previous year, even though I felt great! 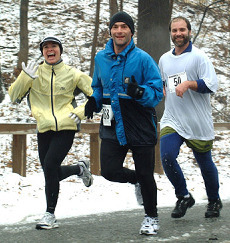 The Icicle Run benefits the Central Branch YMCA in downtown Wilmington. The race starts and finishes directly in front of the Y and brings out only the most serious runners...or those that have no choice since they're in training for Spring marathons. Several of the Pike Creek Valley R. C. members fall into both categories. We're preparing for the Paris Marathon (April 4), so it's hard to pass up an opportunity for a long run with 300 other crazy runners. "Coach" Dave McCorquodale and his wife picked me up in overcast, misty conditions for the ride downtown. With the temperature just over freezing, I opted to run in shorts, so as not to disconcert my fellow club members who'd expect nothing less (or more?). About 5% of the runners wore shorts (including the winner, by the way). Everyone gathered inside the warm, dry YMCA to gather our numbers and shirts. Some warmed up on the tiny indoor track - 26 times around is one mile, so don't get dizzy. I ran down a couple icy blocks and found a covered hotel parking lot where I put in about a mile before heading back for the start. As it turned out, hardly any parts of the course had good footing. Nearly every step was hazardous, in ice, slush or snow. Of course any turns or slopes were even more dangerous. As far as I know, there were no major injuries, but we all ended up with wet feet from some large unavoidable puddles. Heavy mist to light drizzle was falling on us most of the way. The best reason for putting up a good time was to get the heck out of the cold, miserable conditions and grab a slice or two of fairly warm pizza! After the race, some of us celebrated with brunch at the Washington Street Alehouse. I usually don't do breakfast *after* pizza, but I usually don't run around in the snow wearing shorts, either.